Citation Information: J Clin Invest. 2019;129(1):281-295. https://doi.org/10.1172/JCI122595. Lipin 2 and lipin 3 in mouse small intestine. (A) Immunoblot analysis of lipins 1, 2, and 3 in proximal small intestine (duodenum). Mice were fasted for 16 hours or were fasted 16 hours and refed 4 hours with a chow or high-fat diet (HFD), as indicated. Recombinant protein controls are shown in the right column (+). Lanes were all on the same blot, but noncontiguous, as indicated by vertical lines. 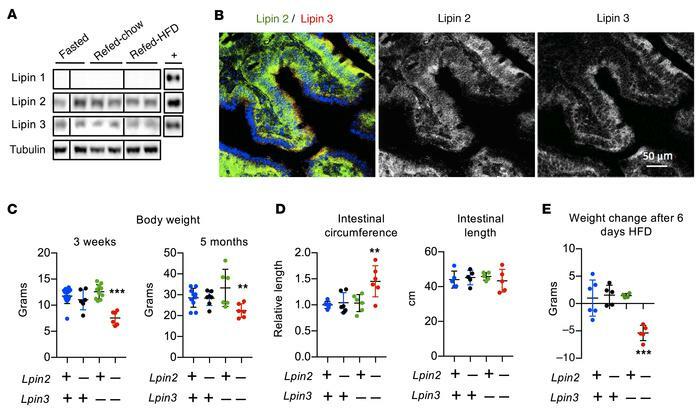 This experiment is representative of 3 studies of lipin protein levels in small intestine from fasted mice, and 1 experiment in mice that were refed chow or HFD. (B) Localization of endogenous lipin 2 (green) and lipin 3 (red) in mouse duodenum shown by confocal fluorescence microscopy. Duodenum was collected from mice fasted for 5 hours. (C and D) Lpin2/3-KO mice (Lpin2–/– Lpin3–/–) have reduced body weight (shown for 3 weeks and 5 months of age), increased intestinal circumference, and normal intestinal length compared with WT, Lpin2-KO, or Lpin3-KO mice. Data shown are average ± SD, n = 6–9/group. (E) Body-weight change in mice fed HFD for 6 days. Average ± SD, n = 4–6/genotype. **P < 0.01, ***P < 0.001 vs. other groups by ANOVA.